The Jazzy 1121 combines outstanding performance with a sleek new design. 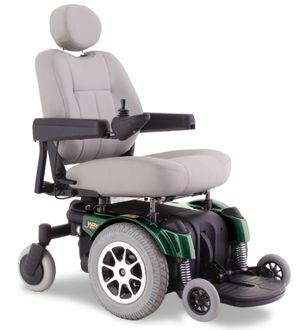 The Jazzy 1121 utilizes Pride's patented mid-wheel drive technology and an overall length of only 39.5" for great tight space indoor maneuverability and a turning radius of only 19.5". Equipped with an articulating rear caster beam, Active-Trac suspension, patented resilient front anti-tip wheels and a top speed of 5 mph, the Jazzy 1121 is ready to conquer all of your outdoor challenges. Active-Trac suspension and rear articulating caster beam for great performance and durability. One-piece, 2" diameter tubular frame for maximum strength. 300 lb. maximum weight capacity. Patented adjustable front anti-tip wheels. Easy accessible side charger port.